Pretty sketchy, even for a ski mask, isn’t it? This is right up there with the Dark Knight Disappearing Pencil Action Toy Pack from Mattel. Which doesn’t exist yet, but give the product development guys over there another month or two to squeeze the final drops of delicious merchandising juice out of the Dark Knight teat. They’ll make it happen. Anyway. The ski mask. It’s sketchy. 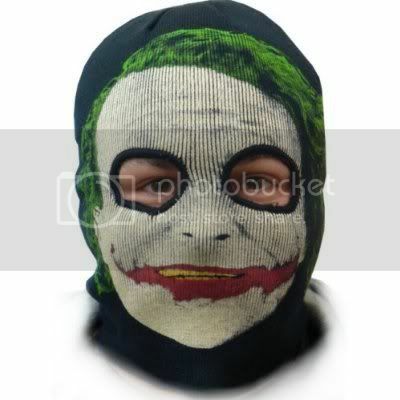 So it double-mints my pleasure that Amazon has listed the official name for this item as “The Dark Knight Joker Combination Ski Mask & Winter Beanie“. Beanie? Beanie’s are for little boys from the 1950s who unselfconsciously skip to class in their pressed overall shorts and then get their asses beat by some kid named “Chip” after school for being so damned dorky.